Cherry Grove is a town located on Fire Island, New York that contains approximately 400 houses on 41 acres. Over 2000 people call Cherry Grove home in the summer months, 20 claim it year round and swarms of people come to visit throughout the summer. Along with its neighbor Fire Island Pines these two communities are considered one of the most desirable and accepting travel destinations for lesbian, gay, bisexual, and transgender people. CherryGrove.com is the leading website for both the Fire Island Pines and Cherry Grove. Here is a great Video on Cherry Grove, and Fire Island Pines. Fire Island, New York, is a barrier island, approximately 30 mi (48 km) long and 0.5 mi. (1 km) wide, in Suffolk County on the southern side of Long Island. Approximately 820,865 people visit Fire Island beaches each summer. How big is Fire Island? The island’s gross area is 19,579 acres. That’s 32 miles in length (48 km) averaging less than 1 miles in width – which is pretty slim. 80% of Fire Island is public park land and will remain open and undeveloped. Fire Island’s park land includes the Fire Island National Seashore, a state park, a county park, and a couple of town parks. 20% of Fire Island is developed, with approximately 4,000 usable lots in 17 small communities. The homes in these communities offer the major Fire Island rental and Fire Island share house resources for public access. Is there a “season” to Fire Island? The most popular Fire Island season runs from Memorial Day until Labor Day. In this window of time, Fire Island is bustling with tourists, Fire Island rental tenants, inhabitants of Fire Island shares, and the year-round inhabitants and locals who grumble at the summer’s sudden population surge. Though Fire Island is a popular New York travel destination in the summer, the “off” season also holds its own appeal. After Labor Day, inhabitants of Fire Island rentals, Fire Island shares, and other Fire Island real estate properties gradually depart, leaving the island much less crowded. Some Fire Island hotels offer reduced rates in the off-season, enabling frugal tourists to incorporate overnight Fire Island stays into economical New York travel packages. Fire Island ferry schedules change in the off-season, running fewer ferries, but still enough to get back to Long Island with relative ease. For many, the fall and spring seasons are perfection; not overly crowded, pristine, and peaceful. Keep in mind, however, that many Fire Island restaurants and shops close down after the summer season, leaving limited options. In winter, Fire Island is a ghost town – though approximately 300 people live there year round. If no cars are allowed, how do I get to Fire Island? There are three common ways to get to the Fire Island communities. One is by Fire Island Ferry, the second is by private boat, and the third is by water taxi. Technically, you can get to Fire Island by driving Robert Moses beach, parking in Field 5 and walking – which will eventually bring you to the Fire Island light house. But to really enjoy the heart of Fire Island, travel by water will be necessary – taking a Fire Island ferry is the most popular way to get to Fire Island. Where do I stay in Fire Island? There are a few fine Fire Island hotels to accommodate you. These hotels fill quickly, and reservations must be made well in advance – especially for holiday weekends like Memorial Day or the Fourth of July. With Fire Island real estate prices out of reach for most, beach house sharing has become part of the Fire Island community culture. 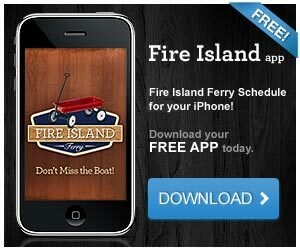 Fire Island shares offer visitors the opportunity to experience living on Fire Island without a major investment. Fire Island rental properties abound, and with Fire Island shares, these beautiful beach houses are transformed into festive party houses where old friends can gather and new friendships can be formed. How do I get from one Fire Island community to the next? The only automobiles allowed on Fire Island are service and emergency vehicles. Part of Fire Island’s eternal charm is its back-to-basics atmosphere. To get around, you can walk or ride a bicycle. While this may seem inconvenient at first, it adds to Fire Island’s magic and preserves the island’s natural, undeveloped beauty. Without automobiles, Fire Island visitors are forced to slow down, enjoy the scenery, and exercise as they explore. In addition, the elimination of traffic noise and driving aggravation make Fire Island beaches all the more relaxing. What should I bring to Fire Island? · A laid back attitude . . . this is Fire Island, not the Hamptons! · Your license – you will be proofed when you go out no matter how old you are. If you don’t have a license, you must have a picture I.D. that is an official document. · Enough cash to last the weekend. There are only a few ATM machines on Fire Island, most of which have a $100 maximum withdrawal and a $3 charge per transaction! Do I have to pay to use the beaches on Fire Island? With the exception of the Fire Island Summer Club, a small private community between Corneille Estates and Robins Rest, *all* Fire Island beaches are open to visitors without the need for special beach passes or payment for use. Be aware that the Fire Island Summer Club is indeed a private beach, and although the people who live and vacation there are some of Fire Island’s longest residents, they do not take to kindly to people using their private Fire Island beaches. The Fire Island dress code is casual and comfortable. All Fire Island restaurants will welcome you in shorts, but a shirt and shoes are always required. Don’t make the mistake of over-dressing for a night out. If you’re female, avoid high heels, as you’ll be doing a lot of walking. On Fire Island, those who dress to impress and pose with designer clothes find that they abandon their high-maintenance style for beach bum attire. Fire Island is a place to unwind; as urban refugees flee to its silky sands, they shed their ties and constricting clothes – instead opting for the swim trunks, t-shirts, bikini tops, wrap skirts and flip-flops that comprise the carefree wardrobe of Fire Island summer fun. Is there a post office on Fire Island? Davis Park, Cherry Grove, Fire Island Pines, Ocean Beach, Fair Harbor, Kismet, and Saltaire all have post offices.